I guess you can call me Benjamin Button. Well OK, I am not exactly getting younger each day, but my face is far younger for my age than what is deemed normal. So I am told. Regularly. I look a lot younger than I am. What was that? “So what?! You should be glad!”, I hear you say. I am aware that making ladies look younger and other age reducing ideas are a roaring business in this day and age, and the fact that I don’t need them (yet) is despicable to you. But hey, hear me out. The judgement I face regularly isn’t great either. Yes, I am only 22, married and proud mummy to a one year old baby boy. I understand that is deemed to be a young enough age already, without adding a face that actually looks like it belongs to a 16 (sometimes 14!!) year old! You see, I was still being offered the child ticket on the Arriva Bus back when I was in England, whilst studying for my degree at university. Don’t get me wrong, I am happy with my face, body, looks etc, but I don’t appreciate the comments some people spew out. However, post baby, these comments and questions come with an undertone. An undertone that irritates me very much. The one that questions whether I must be mature enough to handle such a big responsibility. The undertone of mockery at how amateurish I look. The worrying looks of whether I must be able to keep my baby alive and well. “But you look so young!” … “How old are you? !”… “Is he YOUR baby? !” … “Oh, I didn’t even think you would be married!” OK, I get that you are curious, but do you REALLY need to ask that question? As Baby Z gets older, the reactions are coupled with even wider eyes, wider gaping mouths and longer blank stares, as they assess my parenting capability in their little minds. This is a sad sight to see. Why is it so easy to pass judgement like that? Why must I answer or even tolerate your questions about my looks or age? Why must young parents be made to feel like they can’t handle it. Of course, I did struggle too, and every day with a baby is a learning curve like no other, but that is the same for any first time parent, no matter what their age. In my head, I look forward to the day that I can be considered a cool young mummy by my son when he reaches his teenage years. I hope that being and looking like a young mum means that I can be more in touch with the next generation, perhaps allowing me to better sympathise with issues that Baby Z will face later on. I know that the gaping mouth and wide stares will eventually dissapear, but for the time being I will continue to offer them an outwardly awkward laugh, whilst screaming inside my head. Note: I am not at all being ageist and do not mean to offend older mummies who are ageing gracefully. I am only mortal, and God will surely gift me with wrinkles too. I am simply sharing my perspective and thoughts on what Is an increasing occurrence in my life, which is also beginning to irk me very much. Have you received any judgmental comments pertaining your looks or age? Is it fair to feel irritated or do you feel it is not worth pondering over? Please let me know your thoughts in the comments section below! I couldn’t agree more! I really don’t understand why such comments need to be made. And yes, Haha we must definitely embrace the lack of wrinkles whilst this period lasts! Thank you for reading! ? My parents were young when they had us, around your age I think. They are definitely reaping the benefits of still being young with grown-up children. Thai’s seem to think I look young, my wife has pretended I was a student to get me better deals more than once. I think most people would be able to guess my age though. Yes, whenever I get these comments I do think about the benefits later on. Haha student deals are another great pro to looking young! Thanks for reading! Haha! I get this too! I am not really young looking as I have so many wrinkles already but I am generally small so when I am with young kids they tend to view me as someone their age. One boy I know thought that my husband is my father! Happy to know I am not alone! Having your husband called your father must have been insane!! Absolutely agree that some people need to think twice before they speak. Thank you for reading! Thank you for reading. You’re right, the journey is a rollercoaster enough without adding those side eyes to the mix! Happy to know others agree on this! Gosh I’m not suprised that drives you up the wall!! Thanks for reading! This (used) to happen to me. I got carded at the movie theatre until about the time I turned 24. Wow 24?! That’s insane! Thanks for reading! I’m 36 and work at a university. Only in the last year or so have people stopped assuming I’m an undergrad. Just two weeks ago a coworker was shocked to learn that I had 9-year-olds and asked how old I was. I decided to believe that he meant that I looked incredibly youthful instead of perhaps asking if I got knocked up in high school. I told him I’d had the girls at 27 and left him to do the math. When I applied for the job I’ve now had for 10 years, I went to the hair salon and said, “I have a job interview. Make me look older than 18!” I know I’ll be grateful someday. I know I save money not having to dye my hair when so many of my age-peers have greys. Still, it does get tiring to have people think I’m very young (and therefore immature/inexperienced/untrustworthy). Ironically, some people thought I was my sister’s mother when she was little; I was 10 when she was born. Wow that’s quite incredible. I completely agree, looking young definitely has its pros ad cons, of which the pros will probably be reaped later on in life rather than now. I can’t get my head around how people must have thought you were your sister’s mother at the age of 10?! That must have been hillarious! Thanks for reading! 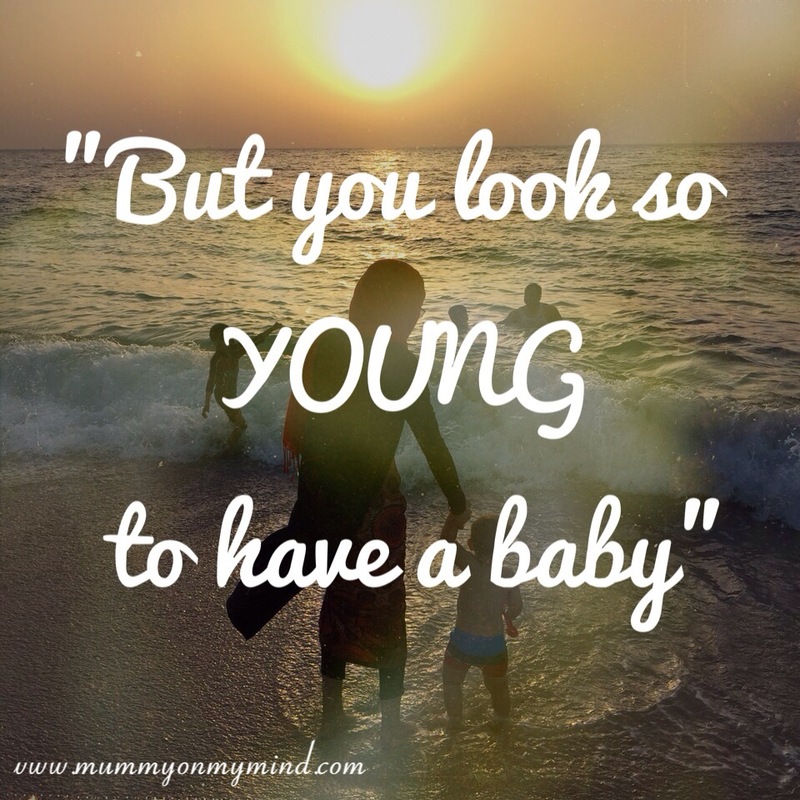 I’m 32 but look younger than my age (and feel it too mostly!) and have 2 boys, I hate the crawly feeling you sometimes get when you know people are looking at you! You honestly don’t look 32! Thanks for reading, and for creating this epic linky! ? Are you sure you aren’t talking about me here? I am experiencing the exact same thing (age vs look). I’ve always experienced it but it didm’t bother me as much until I had my baby boy (who is 8 months old now). I find the question annoying. I did think one would ask a lady about her age. Haha perhaps I am! It’s like having a baby has suddenly triggered this negative switch inside me which makes me see everyone as if they are judging my parenting skills, but boy it really does irritate me!! Happy to know I am not the only one though!